12 million original printer cartridges enter the South African Market every year. Sadly, more than 90% of these end up in landfill sites as most of us don’t recycle our empty printer cartridges. What most of us also don’t realize, is that empty printer cartridges require special disposal and should NOT be thrown away with our everyday garbage. Cartridges that are not disposed of correctly cause environmental harm. This negative environmental impact can be completely avoided if our empty printer cartridges are recycled. Recycling your empty printer cartridges has many positive spinoffs. Firstly, recycling your printer cartridges means that they don’t end up in landfill and in the wrong type of landfill at that. Since the printer cartridges are recycled into new products, natural resources are saved. Recycling also creates a whole new business sector, stimulating the local economy as well as creating jobs. Recycling also uses less energy and water than manufacturing a product from scratch. This means that recycled products have a lower carbon footprint. greenABLE has found an innovative and unique solution for recycling empty printer cartridges, providing income generating opportunities for previously disadvantaged and unemployed people with disabilities. greenABLE is a registered non-profit company that has been in operation since the 1st of June 2011. Our Business model is built and focussed on turning e-Waste into job opportunities. This is achieved through a sustainable recycling project which sells off the plastic and metals derived from redundant printer cartridge waste. 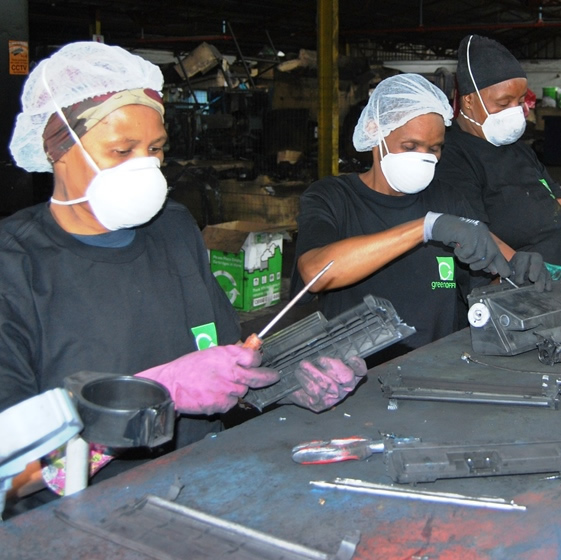 As far as we are aware, greenABLE is the first and only facility in Africa to have found a recycling solution for printer cartridge waste and monthly diverts approximately 10 to 12 tonnes of plastic and 8 to 10 tonnes of metals, which are used for remanufacturing purposes. greenABLE’s goals and objectives are built on six pillars, namely: Job Creation, Skills Development, Employment, Collaborative Partnerships, Sustainability and Environmental Stewardship. to promote co-operation amongst industry related partners for the re-use and recycling of e-waste. Changing the lives of previously disadvantaged people with disabilities by empowering them through a unique sustainable incubator model, which incorporates employment, life skills, education and work integration skills, whilst contributing to greener economy goals of our Country. In addition to turning e-Waste into income, we are positioned to provide various funding / investment opportunities to Corporates, Trusts and Foundations who wish to contribute towards Skills Upliftment and/or Enterprise Development. In the past 3 years, greenABLE has grown significantly. From originally incubating just 2 individuals to currently incubating and providing Employment and Skills Uplifment opportunities to 44 previously disadvantaged disabled individuals (86% female & 56% youth). greenABLE’s core activity is the manual dismantling of empty printer cartridges into their recyclable components. The recyclables derived from this activity, being plastic and metals, are sold to recyclers. This generates an additional income stream into the project as well as provides job creation and development of skills for our Beneficiaries. 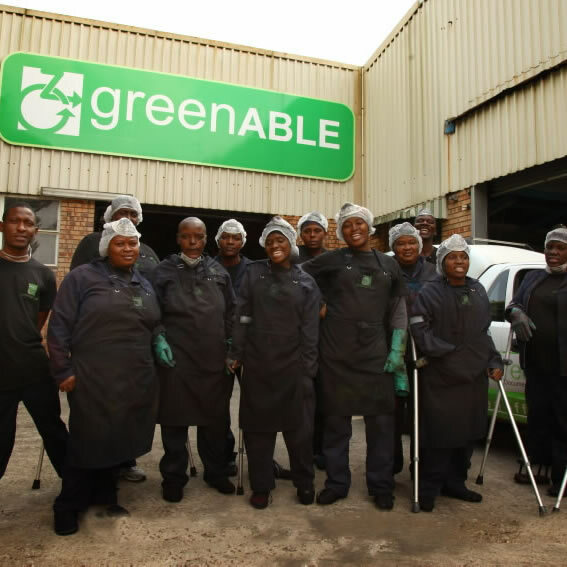 greenABLE is a unique work place 'incubator' for people with physical disabilities, bridging their skills gap and creating jobs out of waste whilst working towards making a meaningful impact on preserving our environment. for persons with physical disabilities, bridging their skills gap, creating jobs out of waste whilst working making a meaningful impact to preserving our environment. Website designed and hosted by Easy2access.co.za.